Rapini, also known as Broccoli rabe is a member of the tunip family. Rapini has many spiked leaves that surround clusters of green buds that resemble small heads of broccoli. Broccoli Rabe has a nutty, bitter flavor, which is good with sauteed garlic. You can see the long leaves, and small broccoli type heads in the picture below of the uncooked frittata. Frittatas are so versatile, as you can see, because except for the eggs, you can add any veggies you have in your fridge, and vary the cheeses, as well. This meal comes together so quickly, and tastes so good. Serve the Frittata with a salad, a glass of white wine, and you are good for the evening. We will definitely make frittatas again. Heat oven to 425°F. Coat 1 10” ovenproof skillet with cooking spray and set aside. Heat Smart Balance in the skillet over medium heat. Cook onion and garlic until soft but not brown, about 2 to 3 minutes. Add blanched Broccoli Rabe and cook 2 to 3 minutes. Remove from heat. Lightly whisk eggs and egg whites in a large bowl. Stir in sun-dried tomatoes, cheese, basil, Broccoli Rabe mixture, and pepper. Pour the egg mixture into skillet, and bake until puffed and firm in the center, 12 to 14 minutes. ** If you use Broccoli Rabe, blanch in boiling water for 1 minute, and the place in ice water to set the color, then chop in 1’ pieces. I think you just found me breakfast. It looks fantastic. I don't have any broccoli rabe in the house, but I'm sure I can scrounge up something tasty. It looks delicious! My mama would absolutely LOVE this recipe! Thanks so much for posting it. :) I'll have to make it for her sometime! My husband loves recipes like this! I have never used broccoli rabe before, but will have to try it! Christiane-Happy to provide breakfast for you. You can use any veggies, that you have in your fridge or pantry. I hope that I get the little ramekins, too. Thank you for your kind words. This frittata is family friendly, so you can tailor the ingredients to your family's taste preferences. Jill-I had never used broccoli rabe before either, but it gives the dish a nice flavor, and is easy to work with. 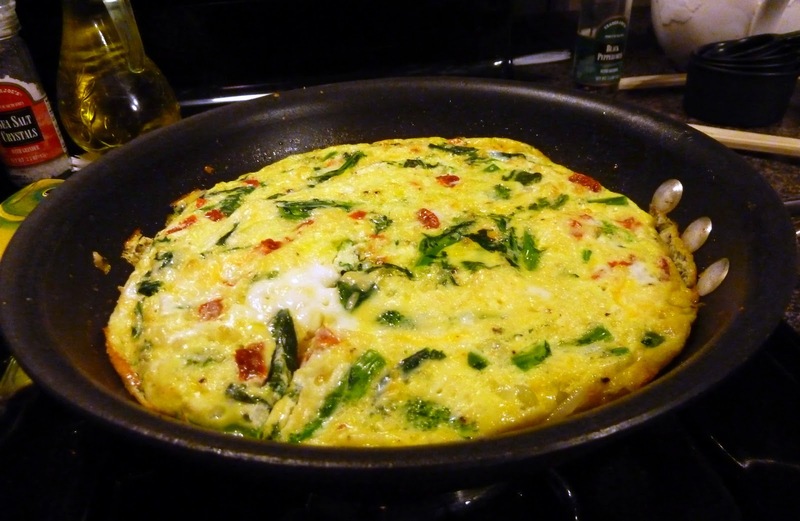 Frittata is one of my go-to easy meals when I don't have any other idea. Love the rabe and sundried tomatoes in this! Oh yes Becky, you should add some cute little ramekins to your Christmas list. They just seem to make food taste better, lol, or is that just cuter. This is a nice easy and tasty supper. Hope you have a great weekend. Yum! This recipe looks scrumptious! Carolyn- Frittata is my new go to meal. when we don't know what to have. So easy and delicious. Gina- Little ramekins are just like mini cupcakes, cute! Russell- Thanks for your kind words. This does look tasty as well as healthy! There is nothing better cooked in eggs than fresh veggies. Thanks for sharing this and the suggestion of pairing with salad and wine makes me want this even more. Yum! Tina-This is a delicious easy dish, that does taste good with a glass of wine. This looks good. Hope you get those ramekins for Christmas. Have a good weekend. Christine-this is a good recipe. I hope that Santa brings the ramekins too. Lizzy- If you want a light, delicious Frittata, this is it. Thank you for your sweet comments. Yes, This is a good low fat recipe, with lots of veggies, too. Hope you like it! I wish I had a slice of this now. 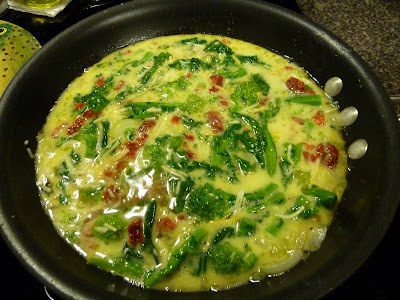 I love broccoli rabe, and you know I love eggs! This lighter version is a great breakfast option. Thanks for sharing. I hope you have a beautiful Wednesday full of laughter and love. Monet- The beautiful thing about this recipe is that you can use any veggies or cheese that you have in the fridge. Happy Wednesday to you and Ryan!